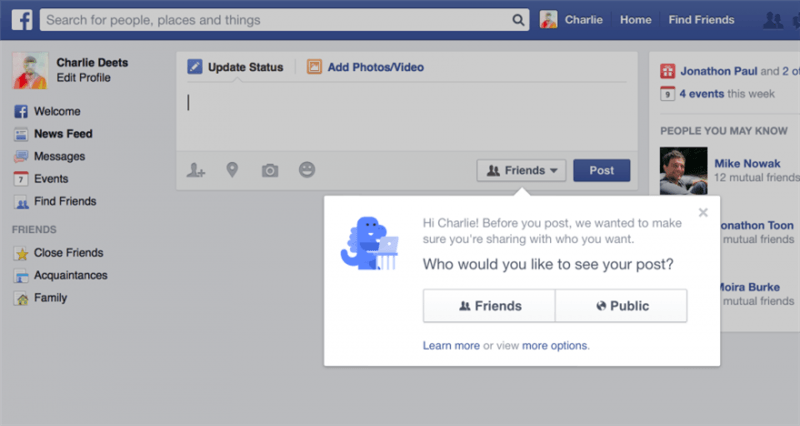 Facebook is changing the default privacy setting for posts so that they’re viewable only by Friends. Until now, when new users sent out photos or status updates, these were publicly available to anyone on or off Facebook unless they manually change the default or restrict the audience for a particular post. Considering a lot people probably don’t bother looking into these settings, today’s change is an important step in the right direction. The change will have no impact on existing users. Only first time posters will see a reminder to choose an audience for their first post, and if they don’t make a choice, it will be set to Friends for them. People can change who they are posting to at any time directly from the status update box, though it’s important to note that this is a “sticky” setting, which means it remains that way until you change it again. In addition to its new posting defaults, Facebook is also expanding its "Privacy Checkup" tool, which will take existing users through a few steps to review things like who they’re posting to, which apps they use, and the privacy of key pieces of information on their profile. Facebook hasn’t had the best track record when it comes to privacy. Although the company has released a number of tools over the years to help anyone customize who gets to see what, their approach to privacy has mostly been about letting users opt-out of stuff, rather than asking them to opt-in. Facebook pointed to other recent efforts to improve privacy, like popup warnings when posting publicly, simplified audience selectors on its iOS app, a redesigned app control panel, and the new anonymous login option.